This entry was posted on March 14, 2019, 7:00 AM and is filed under Fire Department News, Fire Truck photos, New Delivery. You can follow any responses to this entry through RSS 2.0. You can leave a response, or trackback from your own site. 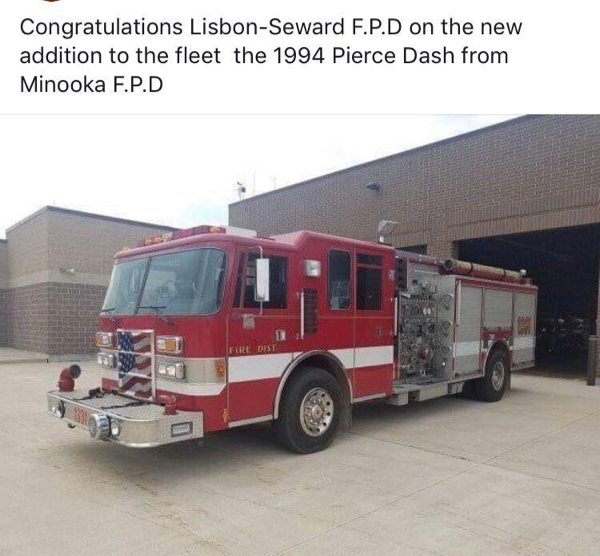 Congratulations Lisbon Seward Firefighters. After seeing this post I talked to one of the firefighters who stated the Minooka engine will be at Station1 and will be there first out engine. Engine 220, a 1993 IH/Alexis will be their reserve for the district and will be at station 2. Engine 227 the current reserve engine, a 1981 IH/Alexis fate is still undetermined and the snorkel is still owned by the chief. Did they not end up keeping the former Orland Snorkel? I really hope they get to actually use it, unlike the whole Snorkel fiasco. That department deserves a good quality piece of apparatus.